I’m having a blitz on processing images that for one reason or another have remained in the ‘to process’ folder. 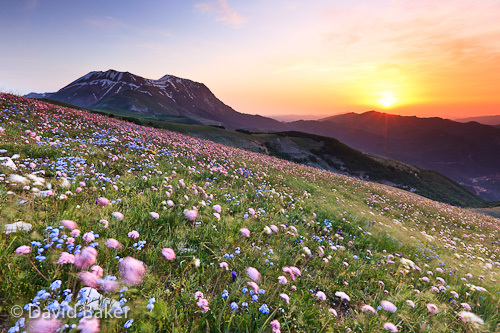 This image was taken in the spring amongst the mountain flowers on the slopes of the Parco Nazionale dei Monti Sibillini in Umbria, Italy and shows the sun rising alongside Monti Vettore. Although over a year old, that mornings shoot was a cracker and I came away with a handful of images I am pleased with. I returned a few days later and although I had a great sky the flowers were almost all gone and the image wasn’t as strong. ~ by David Baker on 10 September, 2010. I hope Stuart is doing his homework. You have set the bar very high! !